Microfilm and Microfiche conversion is the process of creating digital images of all the documents or information stored on it. Record Nations specializes in this type of conversion. We take extra steps to ensure the information is transferred correctly and that all files are easily accessible. Learn more about microfilm and microfiche, and the different ways to preserve them. We also discuss why you might want to consider converting from this storage medium to a digital format. What Are The Different Types of Microfilm and Microfiche? What are microfilm, microfiche, and aperture cards? Learn about them and how all three can be converted to digital images and stored on a cloud service. To preserve the life of your microfilm and microfiche, you should keep it in a climate-controlled location — or look to digital conversion. 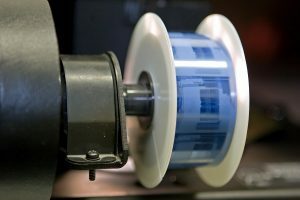 There are drawbacks to using microfilm document storage — it might be time to upgrade your backup system from microfilm storage to a digital storage option. Get Free No-Hassle Quotes on Microfilm & Microfiche Scanning Services Today. Get microfiche conversion advice from the experts at Record Nations. Our microfiche conversion solutions take the stress off your employees and give you reliable documents you can easily access. We work with a team of experts across the country to provide you with the microfiche conversion solutions that your company needs.